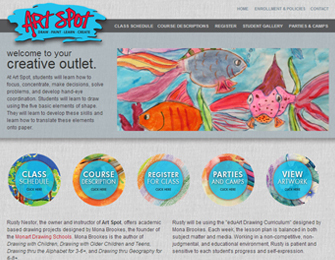 Art Spot was a new business that needed a website. PBD was involved from the start and we helped the owner create a brand for her business and give her the tools needed to get started. 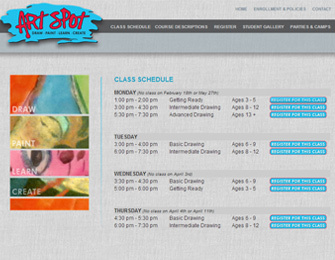 Because the business falls under the category of Art Education, the website needed to be creative and bright. Even though all ages are welcomed, the student focus is between the ages of 3 and 13. The website and other marketing materials needed to be bright and friendly in order to show the teacher's style and reflect the atmosphere of the business itself. We wanted simplicity in function and style so the course descriptions and schedule were presented in an easy to follow format. The descriptions were listed as slide-out drop downs to keep things clean and uncluttered. When the viewer clicks on a description, the information will slide out. To close it, the user will just click on the description again. 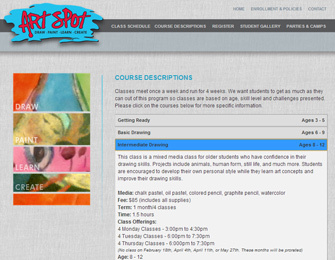 The class schedule is one of the most important aspects of the site. This is where potential students can see what classes are being offered on what days. Registration for each class was implemented into the site with payment information from the registrar being sent through PayPal. 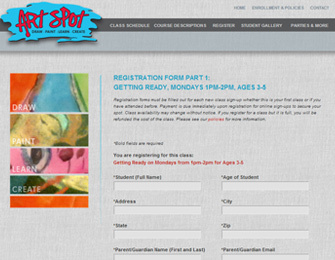 This allows the student to finalize the process in just a couple easy steps and keep things organized for the owner. We make the whole process easy for our clients. Our goal is to make you happy so give us a call if you'd like to be part of our happy family.